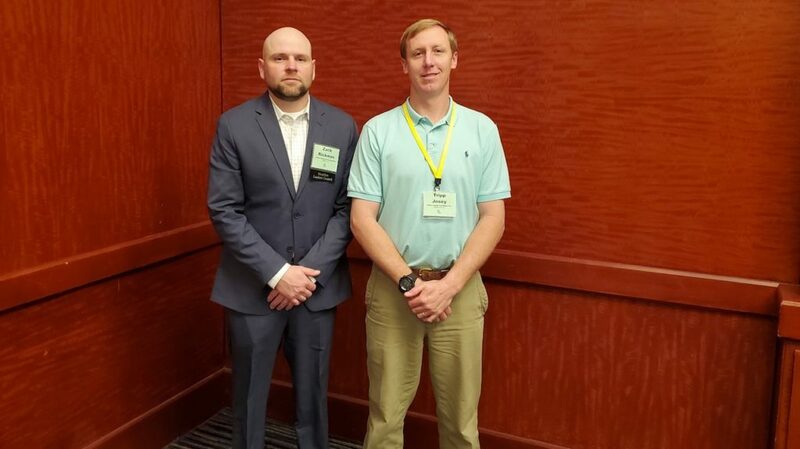 Zack Rickmann and Tripp Josey were elected officers of the Southern Cypress Manufacturers Association. PITTSBURGH — Members of the Southern Cypress Manufacturers Association (SCMA) elected officers for 2019 at the association’s Annual Meeting on March 20, in Savannah, Ga.
Tripp Josey, of Josey Lumber Company in Scotland Neck, N.C., was elected SCMA president. With more than 17 years of experience in the lumber industry, Josey serves as vice president of both Josey Lumber Company and JOCO Lumber. He joined the company in 2002, following his graduation from North Carolina State University, where he earned a Bachelor of Science in agricultural business management with a minor in forestry. Zack Rickman, Atlanta Hardwood Corporation (AHC), in Mableton, Ga., was elected SCMA vice president. He joined AHC in 2005 and currently serves as vice president of operations at AHC Hardwood Group, North Georgia, where he is responsible for production at four lumber yards, including remanufacturing and millwork facilities; distribution; production personnel; and capital expansions. Rickman earned a Bachelor of Science in wood science and forest products from Virginia Polytechnic Institute and State University. The Southern Cypress Manufacturers Association is a non-profit organization dedicated to the promotion of cypress building products to trade professionals and consumers.